1965 Hasbro Little Miss No Name doll, 15"
Hasbro began in 1923 and is still in business today. 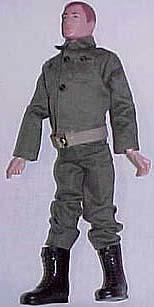 Hasbro is probably best known for producing the GI Joe action figure doll from 1964-1978 which was designed by Don Levine a Vice President at Hasbro. See the many Hasbro dolls identified below. 1963-1978 Hasbro G. I. Joe doll, 11 1/2" tall, action figure, there are reportedly more than 500 figures, vehicles and accessories for the G. I. Joe action figures. 1963 G. I. Joe doll, 11 1/2"
1965-1968 Hasbro Dolly Darlings dolls, 4 1/2" tall, all vinyl, molded or rooted hair, open mouth, ballerina like hand pose: they are all here, several pages, hatbox, boxed pink and blue, carded pink and green, prototypes, flower darlings, playhouse, Palitoy UK Dolly Darlings, too. 1965 Dolly Darlings doll, 4 1/2"
1965+ Hasbro Little Miss No Name doll, 15" tall, vinyl and hard plastic, jointed body, molded tear, big forlorn facial expression, rooted hair wearing a burlap patched dress. 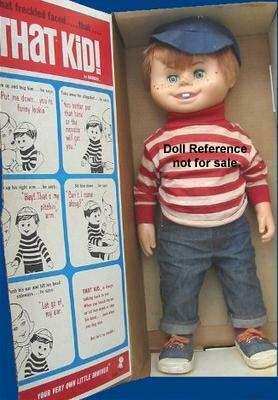 Doll marked: 1965 Hasbro. The Little Miss No Name doll, was also available as a mail in premium located on boxes of Borden's Dutch Instant Chocolate in 1967. 1965 Little Miss No Name doll, 15"
1966 Hasbro Peteena Poodle doll, 9" tall, plastic fashion pooch of this era. 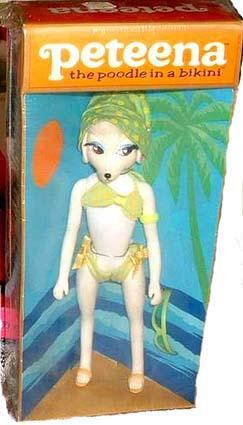 See this page for more details on Peteena Poodle doll and fashions. 1966 Peteena Poodle doll, 9"
1967 GI Nurse Action Girl doll, 11 1/2"
1967 Hasbro Showbiz Babies dolls, 4" tall, dolls of popular singers from this era. 1967 Peter Noone doll 4"
1967 Hasbro Storykins dolls, 3" tall, Liddle kiddle like or competitor dolls based popular on fairy tales. See this page for more details on all the Storykins dolls. 1968 Hasbro Flower Darling dolls, 3 1/2" tall, all vinyl, rooted hair, open mouth, each tiny doll is attached to a plastic flower, based on her name. See this page for Flower Darlings dolls, original artwork and more details. 1968 Rose Flower Darlings doll, 3 1/2"
1968 Hasbro That Kid doll, 21" tall, jointed body, battery operated, rooted red hair, sleep eyes, freckles and two upper teeth are showing, wore red and white striped long sleeve knit shirt, denim pants with back pocket for his sling shot, denim cap & denim tennis shoes. Marked on head: 1967 Hasbro, marked on back, Patent Pending 1967 Hasbro..
1968 That Kid doll, 21"
1971 Hasbro Beautiful Bonnie Breck doll, 9" tall, vinyl and plastic jointed body, long rooted hair, high heel feet, wearing long blue prairie style dress. Marked: Made in Hong Kong. Advertising doll for Breck Shampoo. 1971 Bonnie Breck doll, 9"
1971 Hasbro World of Love Dolls; 9" tall; Adam, Flower, Love, Music, Peace and Soul. Marked: Made in Hong Kong © Hasbro US Pat. Pend. or 1972 Hasbro Hong Kong. 1972 Hasbro Amiee doll, 16 or 18" tall, all vinyl, jointed body, rooted hair with additional hair pieces, sleep eyes, wearing a long colorful print dress, black sandals and earrings. 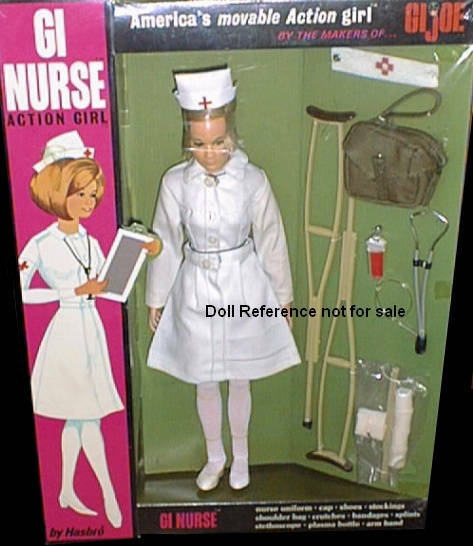 Doll marked: Hasbro Inc 1972. 1972-1973 Hasbro Leggy doll, all are 10" tall, Jill, Kate, Nan and Sue. 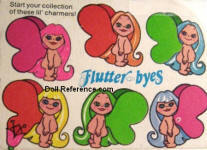 Dolls are marked: 1972 Hasbro. See this page for more details on all the Leggy dolls. 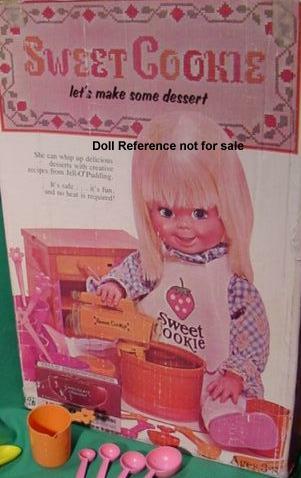 1972 Hasbro Sweet Cookie doll, 18" tall, vinyl & hard plastic doll, rooted blonde hair, freckles, molded painted teeth, wears a white pinafore with "Sweet Cookie" printed on it, and came with cooking accessories. 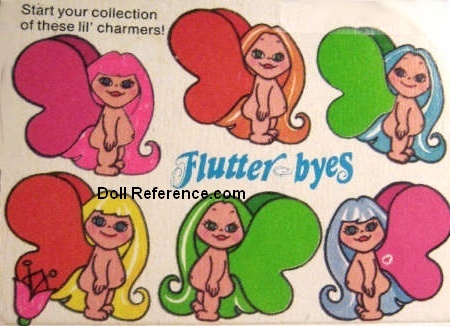 1972 Sweet Cookie doll, 18"
1974 Hasbro Flutter byes doll, heavenly pixies you'll love to collect, six dolls in the series, 2" tall vinyl head, jointed only at the neck hard plastic body, long rooted hair, painted facial features, pouty or smiling closed mouth, doll came undressed with a pair of colored transparent butterfly wings that attach at the dolls neck. 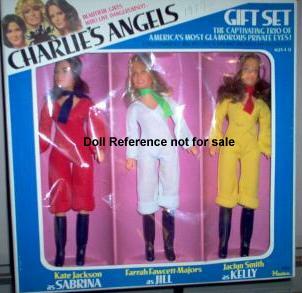 Made in the British Crown Colony of Hong Kong for Hasbro Industries, Inc.
1974 Hasbro Flutter byes doll 2"
1977 Hasbro Charlie's Angels dolls, 8 1/2 tall, Kelly, Sabrina, Jill, dolls were sold separately, as a gift set and with separate fashions with accessories. 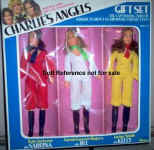 1977 Charlie's Angels doll Gift set, 8 1/2"
1985-1987 Hasbro Jem dolls, 12 1/2" tall, vinyl with rooted hair, rock star dolls based on MTV videos from the 1980s. 1985-1987 Jerrica doll, 12 1/2"
1990s Hasbro Kooshie Koos, Kooshie Koos Sweet Scent, Kooshie Babies dolls, about 3" tall, all plastic non jointed baby dolls, come in various poses; standing, sitting, swimming, have super soft Koosh rubber like hair in single narrow ribbon like stands all over the head. In 1984 Hasbro acquired Milton Bradley, Amsco Toy, Playskool Inc. companies. In 1991 Hasbro added Tonka and Kenner Parker Brothers to their family of toys, board games and dolls.